“In the beginning you were ice-cold; as time goes on you became very sweet,” said an American participant of the ROK National Assembly-U.S. Congress Youth Exchange Project 2010 during a poetry exchange to her Korean counterpart. 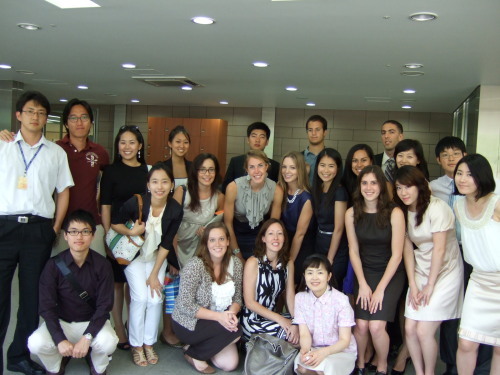 The bond between 20 youths ― 10 Americans and 10 Koreans ― developed over the course of the two- week program, from July 21 - Aug. 4. Jointly organized by the Meridian International Center and the Committee on Foreign Affairs, Trade and Unification of the National Assembly, the Youth Exchange Project was established in 1981. It seeks to promote mutual understanding between the U.S. and Korea through a program of travel, professional meetings and cultural immersion. 2010 pose in the lobby of the Korean parliament in Seoul. During their stay in the U.S., the Korean students experienced a good part of both urban and rural life in America, from visits to New York City, Chicago and San Diego to homestay at Geneseo, in rural Illinois. The agenda comprised of professional receptions, such as meeting at the Department of State and tour of the United Nations headquarters in New York, as well as cultural excursions. Meanwhile, the American delegation, comprised of mostly first-timers to Korea, was busy exploring the ins and outs of Seoul and beyond – including a visit to Panmunjeom and an overnight trip to Jeju Island. Interestingly, the American students cited watching “JUMP,” a non-verbal comedy show based on traditional Korean martial arts, as one of the highlights of their trip. “I got to know the Korean sense of humor, since it was mostly physical humor — a little like the American favorite ‘The Three Stooges,’” said Melissa Murray, a rising senior majoring in Hospitality Administration at Cornell University. Members of the National Assembly as well as officials from the Ministry of Foreign Affairs and Trade, and Ministry of Unification received the American delegation for meetings on the Korean legislative system and the Korea-U.S. bilateral relationship. Crystal Goldie, a native of Silver Spring, Maryland and a student of history, government and politics at the University of Maryland, said she was surprised by the many similarities between the legislative systems of two countries. For Goldie, it was the personal connection formed with her Korean counterpart, Yang Jung-mo’s family during the weekend home stay, that will draw her closer to the region after graduation. “The Mom took me in and I was like her daughter ― she’d hold my hand the whole time, she’d feed me,” said Goldie with a smile.